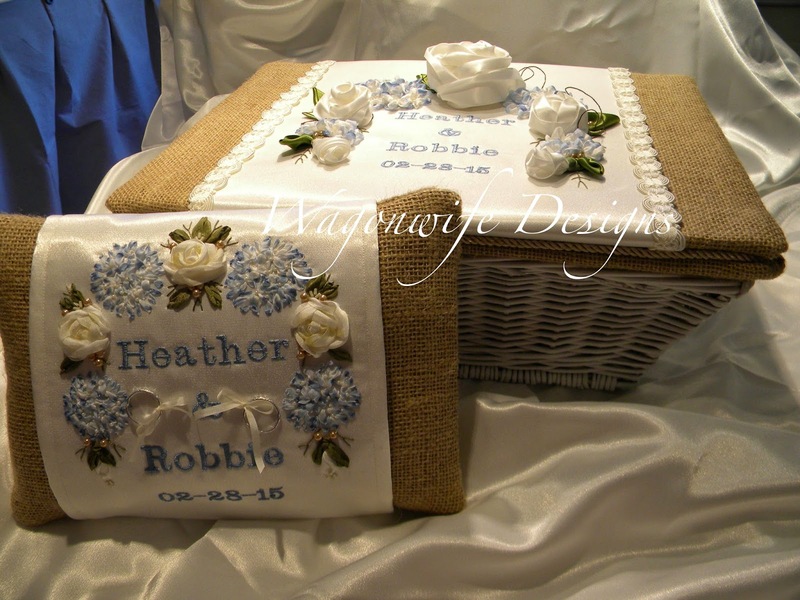 Beneath the Eaves formerly Wagonwifedesigns: A Beautiful Day for a Wedding! A beautiful day for a Wedding. asked for "Country Formal". I wasn't sure want that meant. 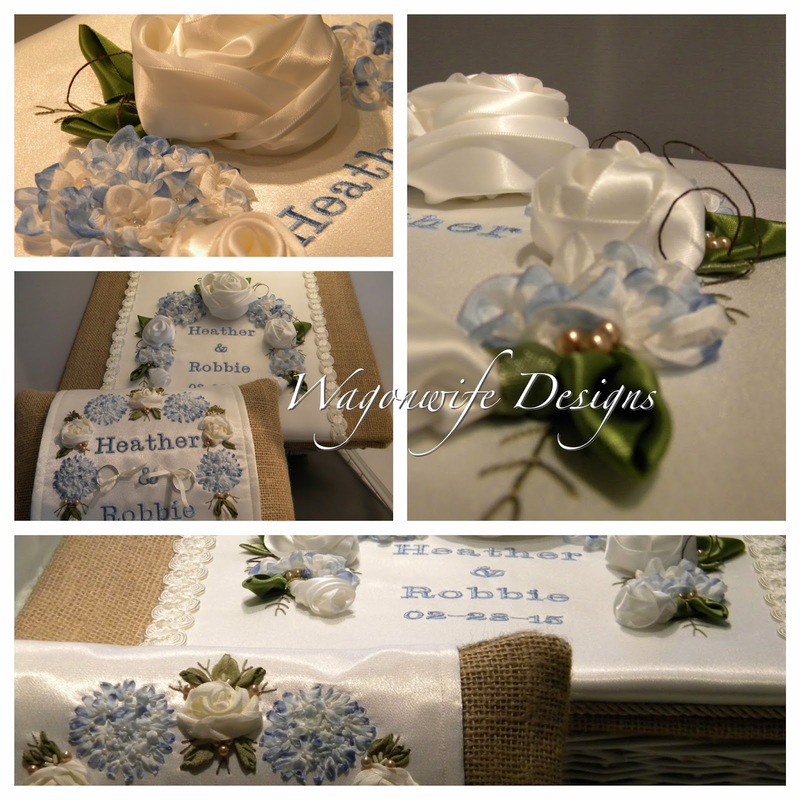 She wanted Burlap and sent pictures of the blue hydrangeas and white roses that they will use in the wedding party. I created an Idea Board with pictures of real bouquets from the Internet to use as a guide to make the satin and silk ones on the pillow and memory basket. Dyed silk tests and burlap scraps. Pictures of real flowers complete the Idea board and help perfect the color in the silk ribbon. Close up of the details. 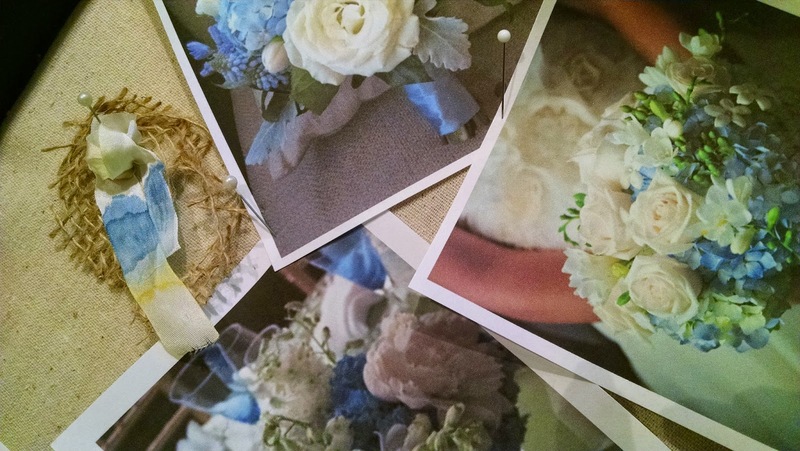 The Hydrangeas were hand-dyed with several shades of blue. The roses with small amounts of yellow and tan to make them life like. over the burlap pillow. The sleeve of white satin was used on the memory box as well. Wishing Heather and Robbie a lifetime of Love, Health, and Happiness. God Bless you both. Absolutely stunning! A real heirloom for the newly married couple to treasure. Best wishes to the happy couple on their special day.